Our first Disney memories may have the same beginnings. They most likely began at a Disney Park where our moms and dads brought us to experience our first interactions with Mickey or Minnie, prince or princess. The magic of creating memories together as a family were stories that we’ll never forget, but are memories that are rarely highlighted as time goes on. We at DisneyExaminer had the opportunity to revisit those stories through the lens of another young couple who just became Disney parents. 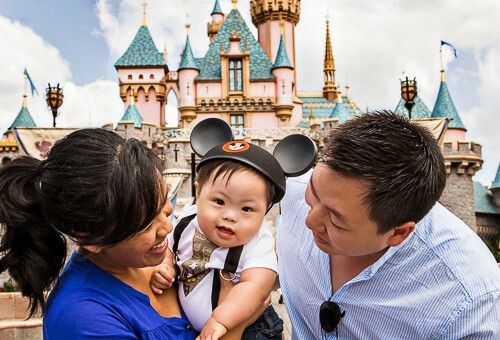 DisneyExaminer photographers David and Drexelle Park have been Disney fans for quite a while like all of us, but now with their new Mouseketeer baby named Knightly around, visiting a Disney Park will be the beginnings of a new magical story in their lives together as a Disney family. The first post by Drexelle and baby Knightly can be found here. Be sure to follow us on Facebook, Twitter, Tumblr, YouTube, and Instagram to know when the next posts go up! Next story Disney Park’s Playful People Puppets.